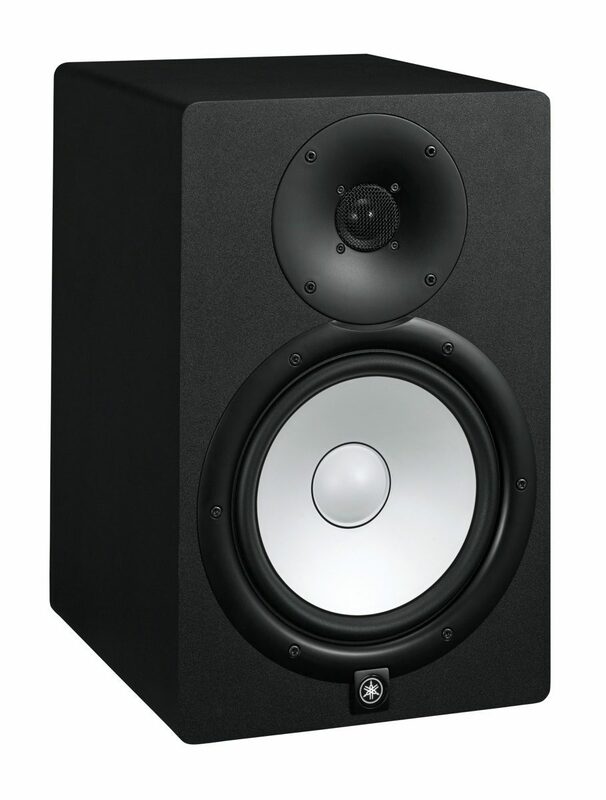 The Yamaha HS8 Active Studio Monitor is the last word in excellence in Yamaha's HS line of powered speakers. In terms of cost-to-benefits, the HS8 unquestionably rewards you for the investment. These monitors' perfectly flat tonal response and true-to-life dynamic rendering yields a sound image that is astoundingly clear. The HS8s are of true bi-amp design, and drive all the way to maximum output without clipping or distortion, while preserving accurate dynamic ratios. Like the rest of the HS line, the HS8s benefit from revolutionary cabinet design. For inspiration in rethinking the HS8's housing, Yamaha drew on their 100 justly celebrated years of piano design. And from their pianos, they developed a three-way mitered-joint technique for these cabinets. This makes them not only minimally cross-resonant, but extremely durable as well. The attractive white 8-inch cone woofer and 1-inch black dome tweeter in the HS5s sit in a uniquely re-designed mounting ring that eliminates any undesirable vibrations. Each monitor also employs an extra-large magnet, creating a more uniform flux field. This yields a smooth response and greater dynamic capability over a wider frequency range. The magnets themselves are selected to provide the greater possible fidelity in the low-end frequencies, which is typically the hardest range to manage when mixing audio. The tweeter frames in turn are built extra thick, minimizing interference in the high end. 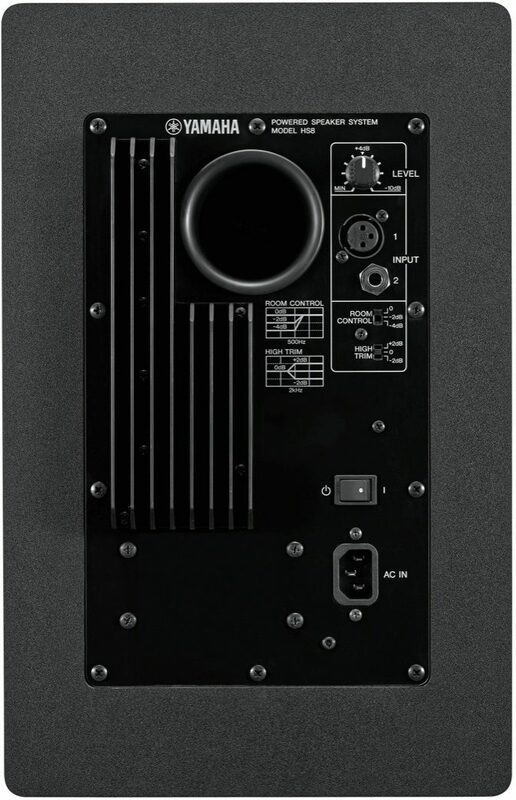 The HS8's 2-way bi-amplified designed means that the woofer and tweeter are powered by separate amps. This eliminates undesirable interaction between the units, and any signal distortion resulting from phase differences. 5.1 and 7.1 surround systems are continuing to become more commonplace in public and private music listening settings. The HS8 is a premium solution for building out your surround mixing station. Combine a set of four or six HS8s with a single HS10W subwoofer and you'll be ready to start mixing multi-channel! Apart from the design of a monitor, the single greatest factor influencing accuracy is the room where they're located. Room size, shape, and surface materials all affect what you're hearing during playback. The HS8 gives you Room Control, Mid EQ, and High Trim controls for good room-matching. You'll tweak the Room Control setting to compensate for any unnaturally exaggerated low end. Then you'll use Mid EQ and High Trim switches to get your mids and highs in the right place. 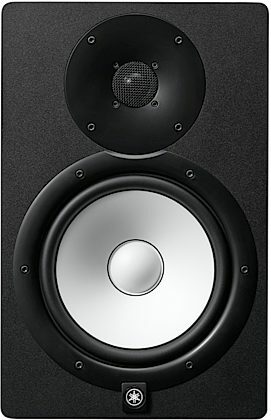 The Yamaha HS8 is a 2-way bass-reflex bi-amplified near field studio monitor with 8" cone woofer and 1" dome tweeter. 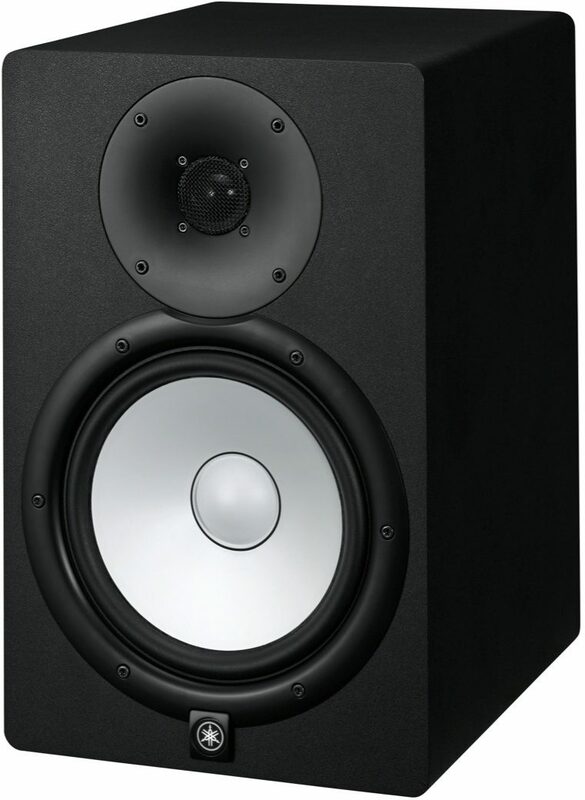 Whether you're mixing for stereo or 5.1 surround, mixes that sound good on Yamaha HS series reference monitors will translate accurately to the widest possible range of reproduction systems -- which is engineer-speak that simply means they'll sound good on anything. And that is the ultimate goal of any reference monitor. It's also worth mentioning that the HS-series monitors not only sound great, they look great, too. The HS Series features transducers that achieve astonishingly smooth response over a wide range of frequencies. Overall: I am very pleased with the HS8 monitors. I have used KRK, Adam, and others. I feel that the HS8 has the best representation of what you are mixing. Other brands I have used seem to have a slight low-mid scoop, or a colored high-end. The HS8's are on the money and probably the best buy of any monitor costing $0-$1000 each. Buy them...you will be glad you did. "F**king AWESOME! Just being blunt! " Style of Music: I primarily work in Hip-Hop, Trap, Pop and R&B genres! I also have experience with electronic, rock and heavy metal music.